A Rugby man who repeatedly stabbed a security guard at a Warwickshire school has been jailed for 10 years. James Dewes, 21, appeared at Warwick Crown Court on Friday, having admitted wounding with intent to cause grievous bodily harm at an earlier hearing. The guard was stabbed six times as he tried to apprehend Dewes at Avon Valley School, Newbold-on-Avon, on 5 March. Dewes also admitted being in possession of items intended to destroy or damage the school, which burnt down in June. He was sentenced to three years for that offence, to run consecutively with a seven-year term for wounding. 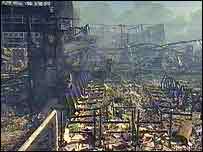 Avon Valley School was almost completely destroyed in an arson attack on 28 June 2004.